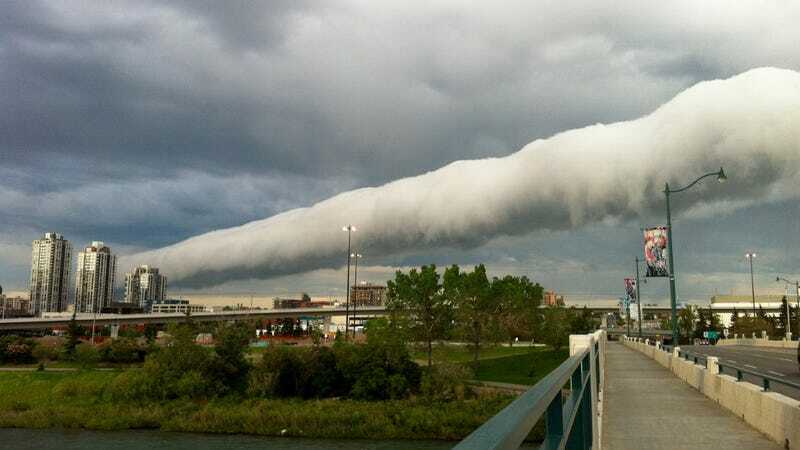 This unique meteorological phenomenon is called a roll cloud, and it's seen here making its away over the city of Calgary, Alberta. Though it looks like a tornado that has fallen down, it's actually a type of arcus cloud — a dense and horizontal cylindrical structure that often appears ragged and turbulent. This photo was taken on June 18, 2013 by Gry Elise Nyland and is used here with permission. A low, horizontal tube-shaped arcus cloud associated with a thunderstorm gust front (or sometimes with a cold front). Roll clouds are relatively rare; they are completely detached from the thunderstorm base or other cloud features, thus differentiating them from the more familiar shelf clouds. Roll clouds usually appear to be "rolling" about a horizontal axis, but should not be confused with funnel clouds.